Back in February of 1986 I had not yet reached my second birthday… I’m not too familiar with the milestones of an aging child, so for all I know I could have still been wearing diapers at that time. Metro-North, founded in 1983, was a fledgling organization. Though we may be similar in age, Metro-North didn’t seem to have much of a “diaper wearing” stage. In terms of the Harlem Line, they hit the ground running – beginning major renovations to the line. The tracks were electrified from North White Plains to Brewster North (Southeast), and over 10 million was spent on upgrading Brewster yard (aka Putnam Junction) and shop. Metro-North was also trying to reach their customers – printing several guides to explain to riders what they do, and give a brief tour of the system. I’d like to have one of these in my backyard. The loco and the castle. Since SmartCat debuted about two weeks ago, I’ve still been working on adding plenty of new material for you all to peruse. 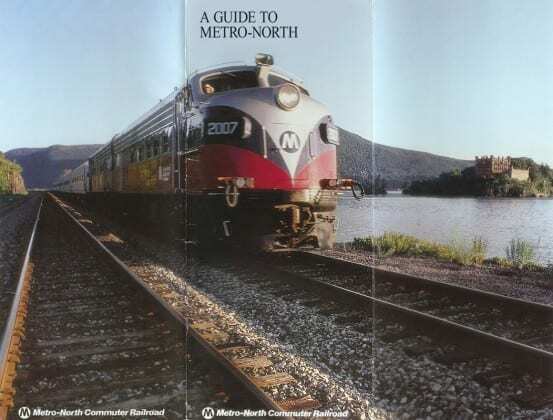 Two of the newest things found in the catalog are two brochures Metro-North released in or around 1986. One was a guide to the Metro-North system, the other a Grand Central and Customer Service guide. Just spotting the little things that have changed over the years is quite fun. It was a time where terrorism was not as much of a concern, and the Terminal had a room where you could temporarily store your bags. And people weren’t quite so health conscious either – Harlem and Hudson trains each had one car reserved for smokers, the New Haven Line had two. Vanderbilt Hall was still a waiting room, and many of the updates – including the other stairwell in the main concourse, and the cleanup of the sky ceiling – in Grand Central had not yet been made. Amtrak trains still stopped at the Terminal, and places like Crugers and Kent Road were still stops listed on the system map. 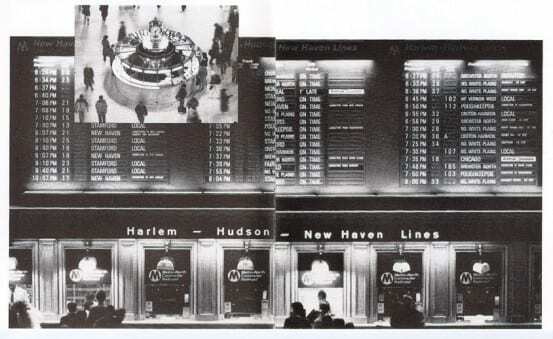 The old Omega departure board can be seen in one of the brochures. It was replaced by an LCD Solari board in the late 90’s. As an addendum to this post, as I’ve gotten a few messages regarding adding things to SmartCat, I would absolutely love user submissions. If you have anything that you think would be archivable, whether it be a timetable, postcard, ticket, etc… send me a message. I’d love to add it!